Madrid played a counter attacking 4-4-2. They fielded a very defensive backline composed of all centerbacks; without a single recognized attacking fullback. 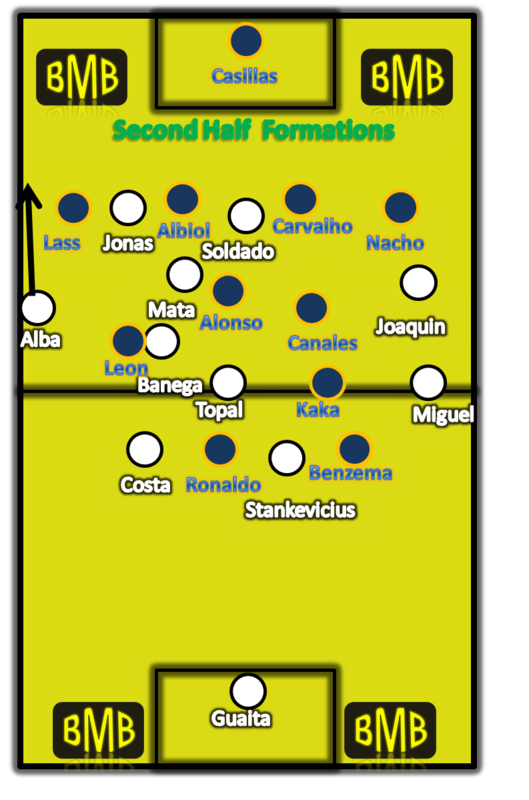 Lassana Diarra held the midfield whilst the other midfielders Canales, Granero, and more so Kaka pushed forward to support Benzema and Higuain. When Madrid defended they usually defended in a 7 block with Kaka usually ahead of his midfield counter parts. By moving into advanced central position whilst Madrid defended he helped Madrid break quickly off the transition with 3 players. Benzema and Higuain who stayed forward would drift to the flanks to provide a wide outlet when Madrid counter attacked. Madrid lured Valencia deep into their half opting to let Valencia come on to them and attack. Although Madrid dominated the score board they never dominated possession at any stage of the match. In the 37th minute they had 46% possession and they finished with a poor 37% possession by the end of the game. Valencia playing at home chose to play an attacking 4-3-3, with their fullbacks Mathieu and Miguel pushing forward whenever possible. They struggle to break down Madrid’s 7 block and create good chances. As only the 3 attacking players with occasional support from the fullback were actively involved in attacking play. 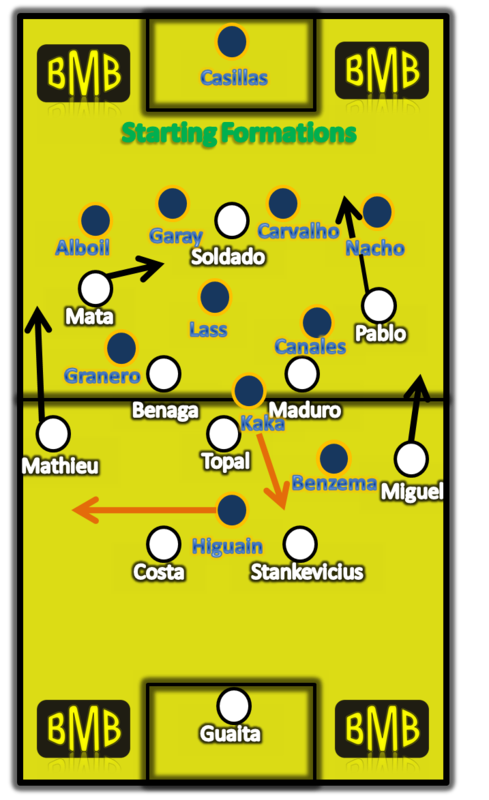 There were few times where Valencia threatened to penetrate Madrids backline with a through ball or a ball over the top, but they were few and far between. Valencia lacked the good finishing and incisive attacking play that made them the third highest scoring team in Spain, with 57 goals in 33 games. Valencia chose to build a majority of their attacks down the flank, but their wingers never go the better of the Madrid full backs. Mata was basically nullified in the first half and Pablo and Soldado failed to make the most of their half chances. 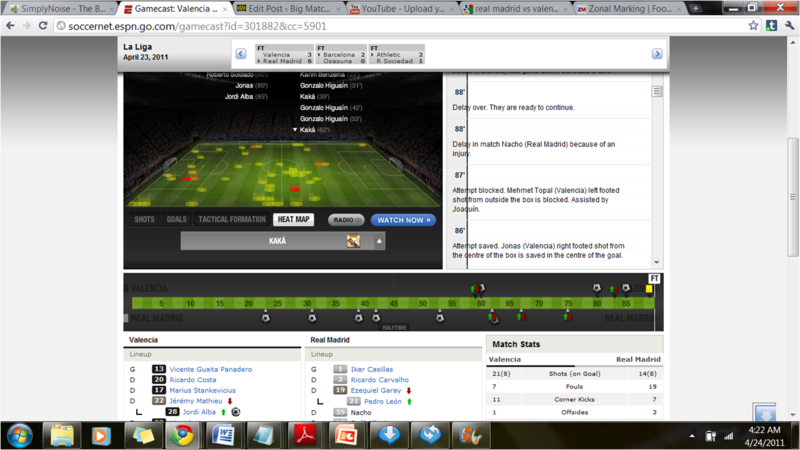 Valencia defended very poorly in the first half. They used a very high backline and opted not to apply pressure to Madrid high up the field. When they weren’t being countered their midfield and defense would hold position below the half way line. This left a Madrid midfield loaded with quality passers the likes of Granero, Canales, and Kaka plenty of time and space in front of Valencia’s defense to pick out the quick Madrid strikers Benzema or mainly Higuain; who then had space to run onto the through balls. Valencia didn’t only leave space in front and behind their defensive unit. They also left space on the flanks of their defensive unit. Their backline was very narrow and as they pushed more men forward to try to reclaim the two goals they had lost. They left more space down their flanks. They pushed their fullbacks forward leaving just their centerbacks to deal with the lightening transitions of the Madrid team. Topal was not close enough or quick enough to help the back 2 deal with this and as a result Valencia suffered. Valencia up high dont apply pressure. 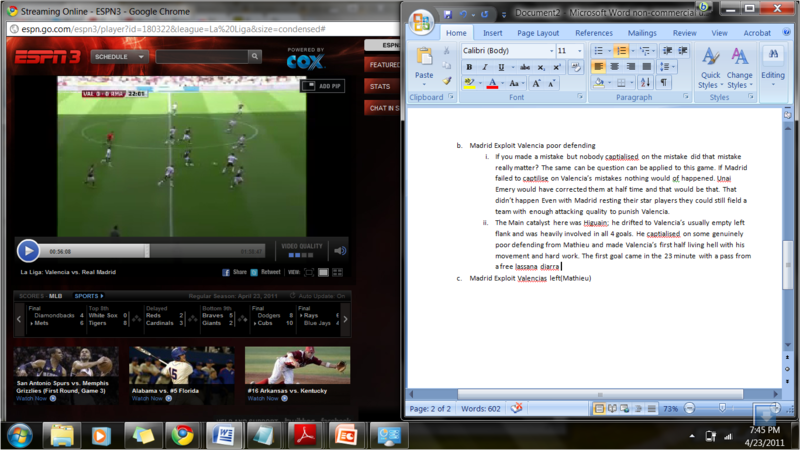 Allow diarra to pass to higuain. The Main catalyst in the first half was Higuain; instead of staying in the center which was clogged because Valencia kept their midfield and defensive lines very tight. He drifted to Valencia’s left flank which was usually vacated by Mathieu. Higuain was heavily involved in all 4 goals and he capitalized on some genuinely poor defending from Mathieu. He made Valencia’s first half living hell. The first goal came in the 23 minute; Mathieu was caught out of position and hassled to get back. A free lass played a pass to Higuain who positioned himself intelligently in the empty channel between Valencia’s Center back and left back. Then he found a free Benzema at the far post with his cross. Benzema also positioned himself in the empty channel between fullback and centerback earlier in the move. Valencia had 2 men and a Topal who was tracking back to protecting their defensive line against Madrid’s counter attacking trio of Kaka, Benzema, and Higuain. Higuain once again positions himself smartly on the fullback(Mathieu) and reacts quickly to the ball that breaks out to the flank. Even though he lost the leg race he keeps hassling and ends up capitalizing on Mathieu’s indecision. 39th minute goal Higuain once again positions himself smartly in the space vacated by Mathieu he crosses to an open kaka. 42nd minute goal kaka latches on a pass from deep midfield. This is another Madrid move that starts off with a player positioning himself in the vacated Mathieu channel. Kaka is given space to run into from Valencia’s high line. Valencia have 2 players on their defensive line once again. Kaka crosses for an open Higuain goal and 4 nil at half time. Kaka had a marginal role in proceedings until he scored. From that point on his influence grew steadily until finally peaking when him and Madrid score their last goal. Kaka played a big role early on in the second half. He set up the 5th goal. He then go free in the “hole” to lay a pass for Benzema to assist Higuain in a goal that was ruled offside. Finally he netted his and Madrid’s final goal of the match with a brilliant solo effort. The first 4 goals came down Valencia’s left but weirdly enough the final 2 came down the right. A side that was left relatively untouched in the first half by Madrid. This might just be attributed to Kaka’s brilliant play early on in the second half.If Higuain was the man who lead the charge in the first half, than Kaka was the man who finished it. He helped Madrid secure an unassailable 5 goal lead by the 62st minute. After seemingly putting the match to bed in the 62nd minute, Madrid started to struggle with the things they found so easy to do in the first half counter attack and defend well. Their midfield players (Pedro Leon in particular) were slower in tracking back; leaving Madrid under manned on occasions to deal with a pressing Valencia side. Aside from a few times where Valencia threw way too many people forward Madrid struggled to counter attack. Even though Ronaldo was brought on 67th minute Madrid struggle to create chances and they ended up pinned in their half for the majority of the match. They took two shots after the Kaka goal. At the 37th minute possession was around 54-46% favoring Valencia, by the end of the match it was 63-37% favoring Valencia. Desperate to restore some pride the second half saw Valencia start pushing more men forward. They changed their formation from a 4-3-3 to a lobbed sided 4-2-4 with Alba pushing forward to become the 5th attacking player on the Madrid backline. 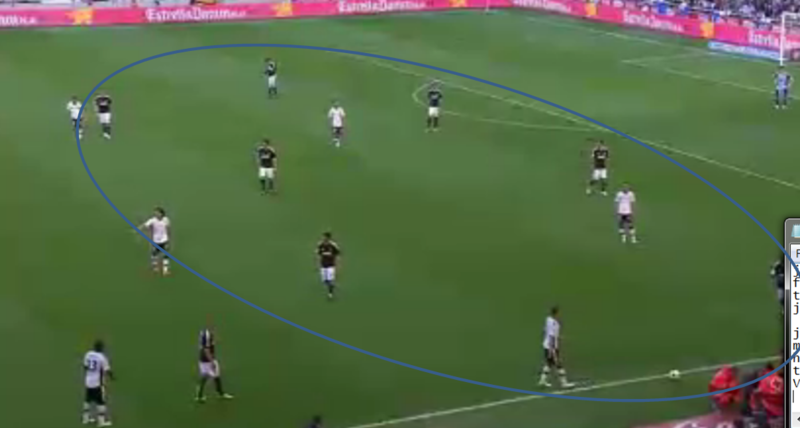 Valencia pushed 7 to 8 players into attacking positions in an attempt to breakdown Madrid’s defensive block. This started to pay off as Madrid’s defending became sloppier, their midfield players failed to track back on a consistent basis and cover their backline effectively. At some points Madrid seemed unable to cope with the number of men Valencia was throwing forward. Madrid didn’t change their system at half time and it seemed as Unai Emery had figured them out in the second half. Valencia started to press Madrid higher up their field; denying the Madrid midfielders space and even forcing a couple rushed clearances from the Madrid defenders. Which was not present in the first Half. Valencia overloaded the left with their attacking players and it seemed to have worked because 2 of their goals came from there. The first goal came from Jonas breaking down the left and crossing and the last goal came through Alba who found himself unmarked on the left hand side. The introduction of Jonas played a big role in Valencia’s mini fight back. He sparked a subdued Valencia attack and brought a quite Mata into the game. He was quick to make his mark setting up Soldado for Valencia’s first goal and then connecting with Mata to get the second. He was generally a pain in the neck for the Madrid defenders. 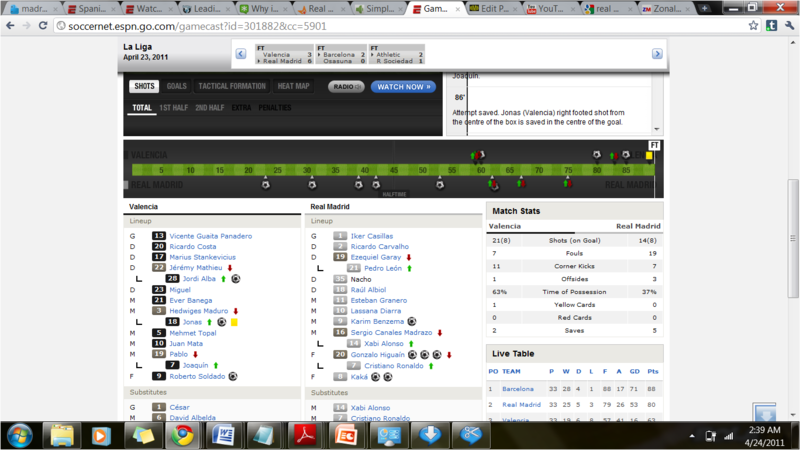 Led by Higuain in the first half and Kaka early on in the second half. There was no way Madrid was going to lose after going 6-1 up. Unai Emery has to be praised though for his changes by bringing on Jonas and Alba and overloading the left; he really helped Valencia back into the game.